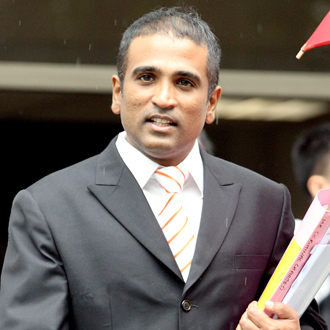 Singapore’s foremost human rights lawyer M Ravi has filed two letters of complaints against two lawyers from the Law Society over moves that raised questions on his fitness to practise law. One letter of complaint was directed at the Society’s President, Wong Meng Meng, and the other was served on member Wong Siew Hong. Speaking to the media at his office on Friday, Ravi attacked the two lawyers for behaving in a manner which does “not befit the conduct” of professionals. Two weeks ago, Wong Siew Hong made a surprise appearance in High Court with a letter from Ravi’s psychiatrist Calvin Fones claiming that he was medically unfit to practice and represent Vellama Marie Muthu. Vellama is Ravi’s client in a high-profile case seeking to clarify the discretion of the prime minister in calling for a by-election. Justice Pillai dismissed Wong’s concerns immediately and continue the hearing which made the Law Society a laughing stock in the eyes of the public. Speaking at a press conference called at his corporate law office on Battery Road on Friday, Ravi claimed that the two lawyers had behaved in a manner. Ravi added that his lawyer Louis Joseph has also been instructed to serve letter of complaints to every member sitting on the Society’s council and would be requesting that they be expelled. There is no immediate response from the Law Society. Prominent Human Rights lawyer M Ravi who won much public sympathy when a Law Society member divulged his medical condition in High Court in a desperate attempt to disqualify him from practicing law found himself in trouble again. According to the state media, a Tamil current affairs producer at MediaCorp has filed a police report Mr Ravi for verbally abusing her during an interview with him. Ms Vicneswary d/o Subramaniam alleged that this happened on 13 July. She claimed that while interviewing Mr Ravi at his office, he became extremely agitated and aggressive and shouted at her, using vulgarities. For some strange reasons, Ms Vicneswary only lodged a police report ONE WEEK later after the fiasco in High Court. MediaCorp is the only broadcasting station in Singapore and is wholly owned by Temasek Holdings, a Singapore sovereign wealth fund headed by Ho Ching, the wife of Prime Minister Lee Hsien Loong. The Singapore media is ranked 150th in the world in terms of press freedom by U.S NGO Freedom House this year. In a sudden twist of events, Human Rights lawyer M Ravi now said he is no longer acting for controversial socio-political blog TR Emeritus. TR Emeritus has earlier said it has appointed M Ravi to handle a fresh case involving Prime Minister Lee Hsien Loong’s young brother Lee Hsien Yang whose lawyers sent a letter to its Singapore-based editor Richard Wan on Tuesday over a defamatory comment posted on the site. According to Channel News Asia, Mr Ravi has confirmed that he is no longer acting for the site and neither does he know who is acting for TRE now and what course of action they plan to take. TR Emeritus is still operating as usual and the defamatory comment on Mr Lee has remained on the site. TR Emeritus has until today to remove the comment failing which Mr Lee is likely to commence legal proceedings against it. As the real owner of TR Emeritus is a foreigner living overseas, its Singapore editor Richard Wan will have no choice but to take the rap for it. Embattled socio-political blog TR Emeritus will not accede to demands made by Mr Lee Hsien Yang, the younger brother of Prime Minister Lee Hsien Loong and has appointed prominent Human Rights lawyer M Ravi to fight the case. Mr Lee Hsien Yang, the chairman of listed conglomerate Fraser and Neave (F&N), has sent a lawyer’s letter to Mr Richard Wan, TRE’s official representative in Singapore on Tuesday, asking the site to remove an allegedly defamatory comment on its site about him. Mr Tan Chuan Thye from Stamford Law, who is acting on behalf of Mr Lee told TRE in the letter that a netizen had left a defamatory remark about Mr Lee in the comments section for one of its articles late last month. The comment was found on an article about allegations concerning Hougang MP Yaw Shin Leong’s personal life which was published on 30 January and was still on the website as of midnight last night. According to the Straits Times, today is the last day for TRE to comply with the lawyer’s demands. It is not known what Mr Lee’s demands are exactly. However, based on previous cases, TR Emeritus’ chance of defending itself is very low and it will probably be bankrupted and forced to close down by a defamation lawsuit.